Like a lot of email marketers, you spend a majority of your time writing promotional emails. You focus on announcing new products, sending out coupons, promoting sales, and getting the word out about upcoming events. And when you build those promotional emails, you likely obsess about your open rate. After all, the content of your messages doesn’t matter if no one opens them. But the emails your subscribers are most likely to open and consume aren’t your promotions. They’re far more concerned with their transactions—the purchases they’ve already made with your store. 64% of consumers consider transactional emails (like shipping confirmations) the most valuable messages they receive, according to Litmus. 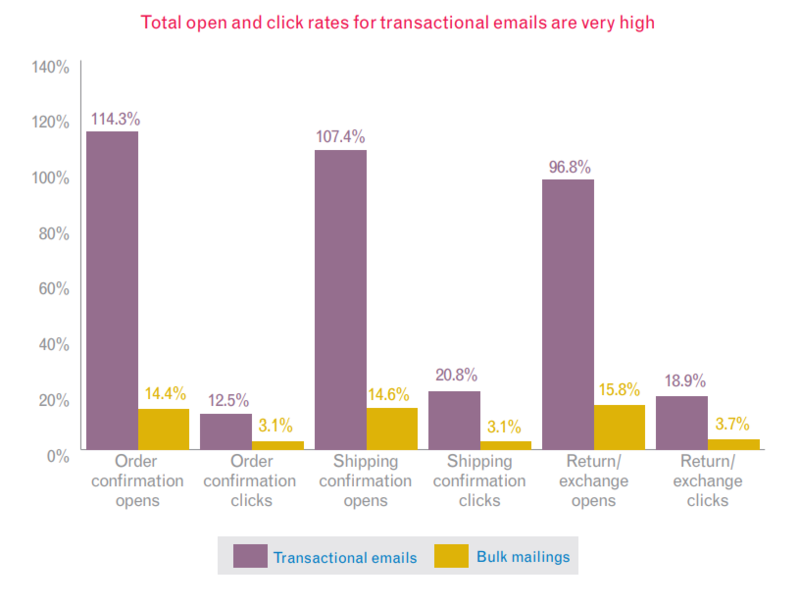 One Experian study found that transaction emails, like shipping and order confirmations, achieve significantly higher open and click rates than promotional emails. 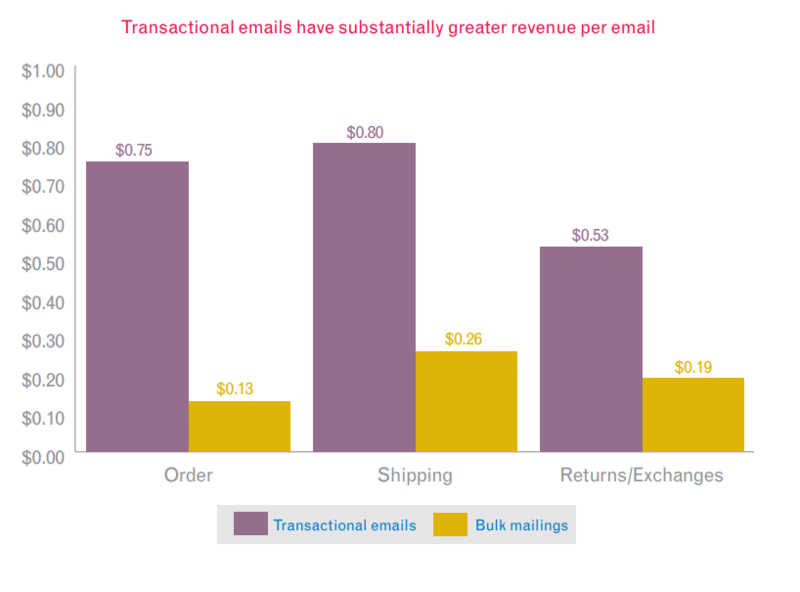 They also drive substantially more revenue per email. 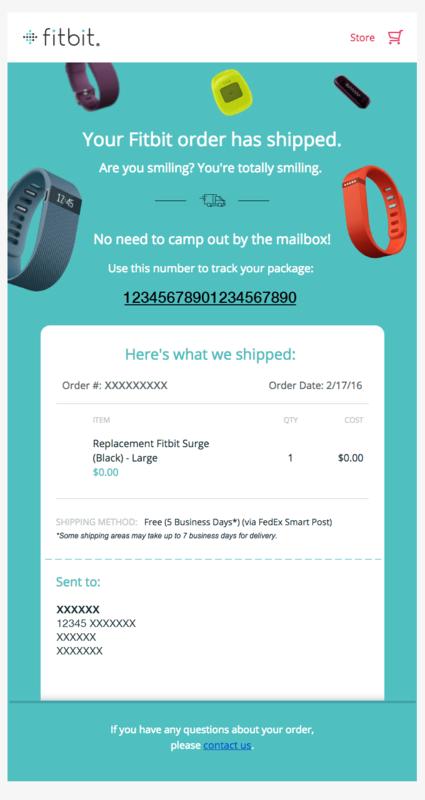 Shipping confirmation emails, which the Experian study found had the highest click rates, are simple notifications that inform your customers that their order has shipped. But this simple email is a big opportunity to add value to the transaction, build customer loyalty, and express your brand personality. 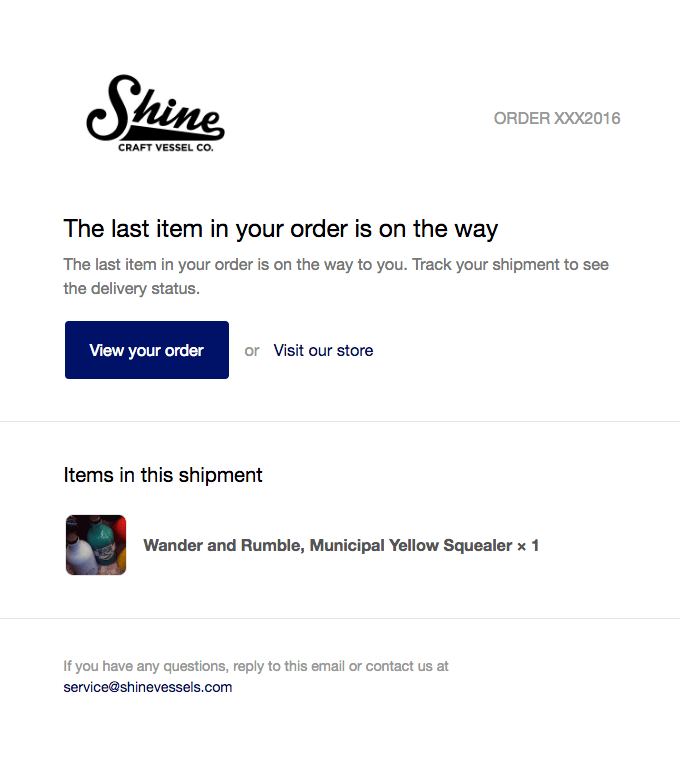 So how do you create a powerful shipping confirmation email? While it’s often useful to be clever or witty with the subject lines of your promotional emails, transactional emails should always use clear and straightforward language. In fact, many customers will delete the email without ever opening it. If you think your customers do it, don’t worry. The email has still served its purpose. The data shows that these emails have higher-than-normal open rates, but even when they aren’t opened, if you’ve provided clear information in the subject line, you’ve probably already received the benefit of creating a positive brand experience for your customer. When your customers open the email, there should be no doubt why you sent it. Put the words “Your order has shipped” (or similar) at the very top so there’s absolutely no confusion about the email’s purpose. They’ll be more receptive the rest of the email’s contents if you immediately deliver the good news that their product is on the way. Just like the subject line, there’s a good chance your customers will read this heading and skip the rest of the email because they understand the message. While the best outcome for you is certainly for your customers to read through the entire email and absorb every part of your message, as long as they come away from your email with a positive experience and useful information, you’ve done a good job and your brand will benefit. Above all, your customers want to keep tabs on their order. If there’s a problem with the shipping, they want to know right away. Tracking also helps your customer overcome any lingering anxiety about making a purchase with your brand. They know that if you include a tracking linl, you’ve already fulfilled your end of the bargain. The tracking link is concrete confirmation that they made a good decision to order from you—they know their product is already on the way. 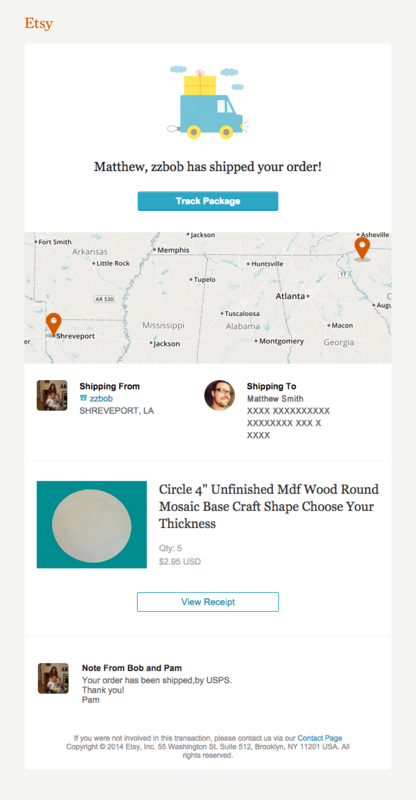 Your customers will interact with the tracking link more than any other component of your shipping confirmation email, so use it as your call-to-action. 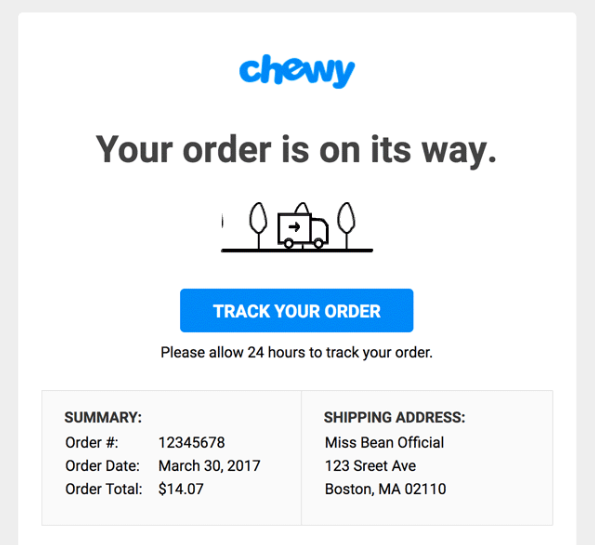 Make the link or button stand out, as the the Chewy shipping confirmation email above does, so the customer identifies it right away. Amazon does this better than anyone by making it the focus on their shipping confirmation email. By the time you send a shipping notification email, you should have already sent an order confirmation / receipt email. So your customer should have a pretty good idea of what they purchased and how much they spent, but it can’t hurt to give them a friendly reminder. It’s not that people forget what they buy online, but reminders can renew the sense of excitement they got when they originally purchased the product. Instead of thinking “My order will be here soon,” they think “Awesome! My killer new fishing rod is almost here!” It’s a subtle change, but it nudges the user from good experience to great experience. This Everlane email does a great job of using reminders. They confirm shipping right in the header to get that part out of the way. Then they remind the customer where the item will be shipped and who it was billed to. Below that, they list the entire order and payment details. One of the advantages of giving the customer so much information in their shipping confirmation email is that they have another opportunity to verify that everything is accurate. For instance, they might notice that they ordered the wrong size or forgot to use a coupon. Even though the order is already out the door, you’ll still want them to contact you as soon as possible with their issues. Furthermore, it’s smart to anticipate some of their questions and add links right in the shipping confirmation email to help. For example, if you know the first thing the owner of a new drone will want to know is how to fly it, link to the guide on your website. This way they’ll get the most value out of the product as soon as they receive it. You might send some of this information in other post purchase or thank you emails, but it’s okay to repeat it. Adding vital information, like product how-tos, warranty, or return policies, into multiple emails will increase the likelihood your customers actually see it. Any time you send a message to your customers, you have the opportunity to create more sales through upselling. 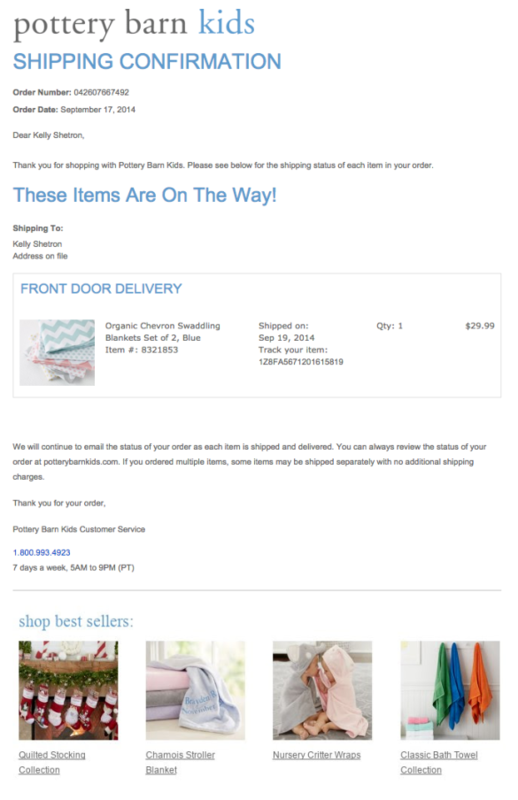 Transactional emails like shipping confirmations are no different. 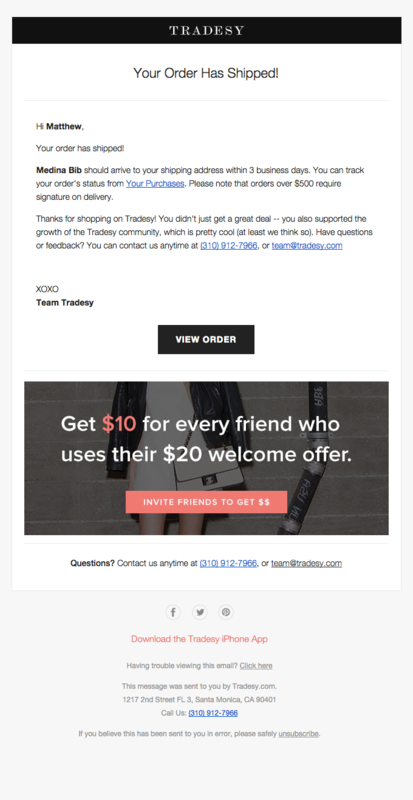 Throw a few products at the bottom of your emails to entice customers to make additional purchases. You already know they’re comfortable buying from your store, so all you have to do is present the right products that pique their interest. Instead of showcasing a lot of products, choose products that directly relate to the customer, but not products that overlap with their recent purchases. For instance, if the customer bought a pair of gloves, don’t show them more gloves. What are the chances someone will want to buy two pairs of gloves in a short timeframe? But the customer may want to see scarves or boots. One option is to simply populate every shipping confirmation email with your best selling items. This is a good strategy if you only have a small line of products. 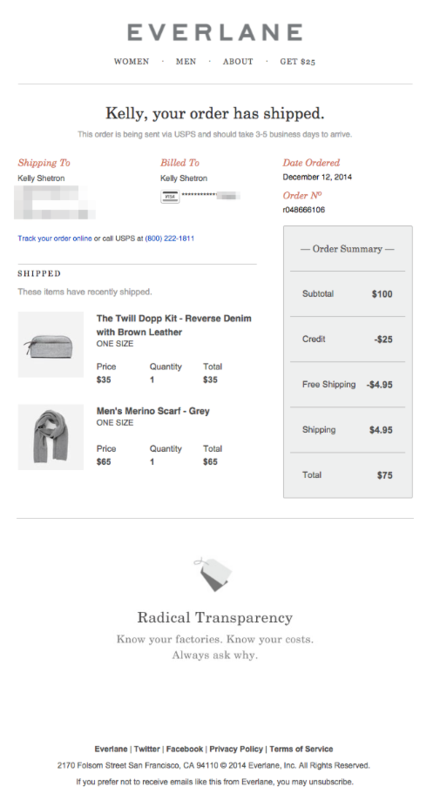 If you choose to include upsell opportunities, make them secondary to the shipping confirmation. Your customers shouldn’t have to wade through your sales pitch to get to the heart of the message. Besides, according to the CAN-SPAM Act in the U.S., the content of transactional emails must be primarily transactional. Tip #8: Don’t forget your branding! 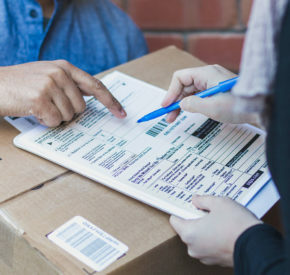 Shipping confirmation emails are generally short and sweet, but that doesn’t mean you have to forgo your usual branding and voice. Branding your emails consistently is an important way to cement yourself in the minds of your customers. However, don’t fill the email with unnecessary images and text. 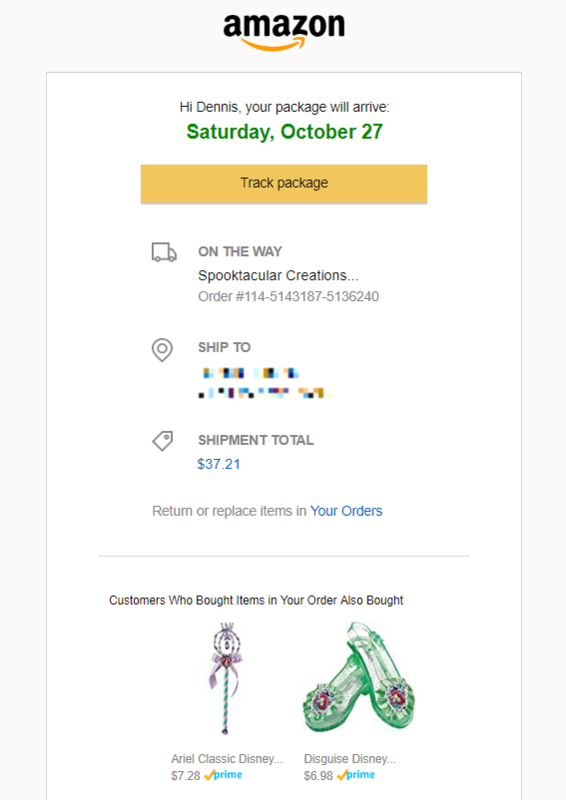 If you think a bit of creativity and styling are necessary to display your brand personality, use it, but don’t look for things to add to your shipping confirmation emails. Do remember to write your shipping confirmation emails with the same brand voice you’ve established in your other communications. Consistency across all your marketing emails—including transactional emails—is smart and helps to create a cohesive brand experience for your customers. Remember: These are transactional emails your customers will consume for their information quickly. Don’t force them to wade through too much stuff just to find the nugget of value they need. 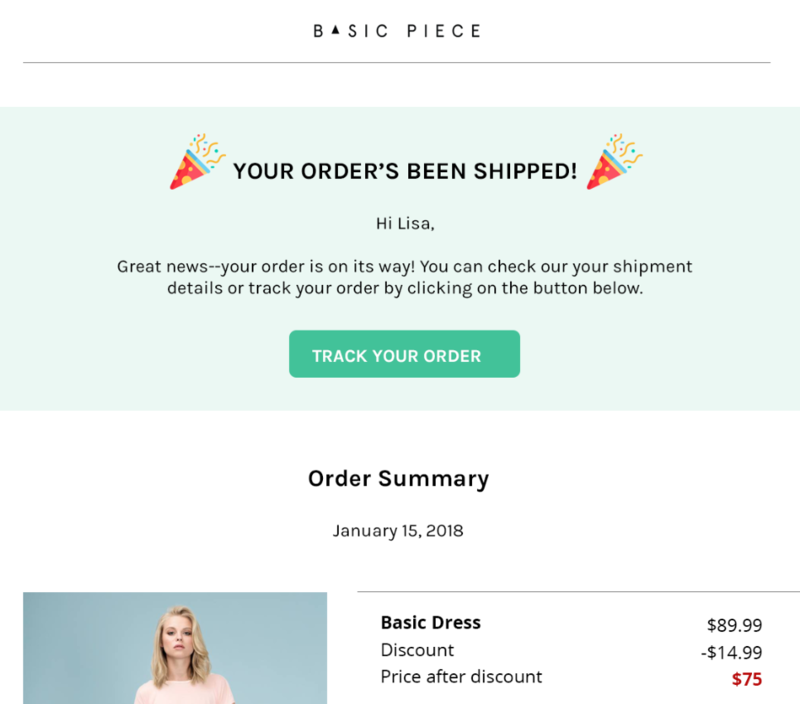 Before you start optimizing your own shipping confirmation emails, check out some of these great examples for inspiration. Super simple and easy to consume. Clear and succinct subject line and headline. Includes a photo of the product. Subject: Today is the day! Your order has been shipped. Superb branding. It has personality, but it doesn’t get in the way. Includes reminders, like the product variables (in this case size and color), price, order number, order date, shipping method, and billing information. Good branding without disrupting the message’s purpose. Includes a photo of the products. Includes reminders, like the product variables, price, order number, order date, shipping method, discount, and billing information. Offers some extra reminders at the bottom about some of the value Chewy provides, like easy returns and 24/7 customer service. Clear and succinct subject line and headline (though it could probably be friendlier!). Includes tracking link and delivery date. Includes reminders of the product’s specifications. Includes some frequently asked questions right in the email (no need to click elsewhere). Offers some soft upsell opportunities at the bottom. Includes reminders of the product’s specifications and price. Includes a link to view the original purchase receipt. The map is a nice feature that helps the customer understand how far the product has to go, which helps them accept the wait. The note from the seller (Etsy is a marketplace) is a nice touch. This email is written like a letter to a friend, which is unique for automatically generated content. Reminds the customer to take part in the referral program. 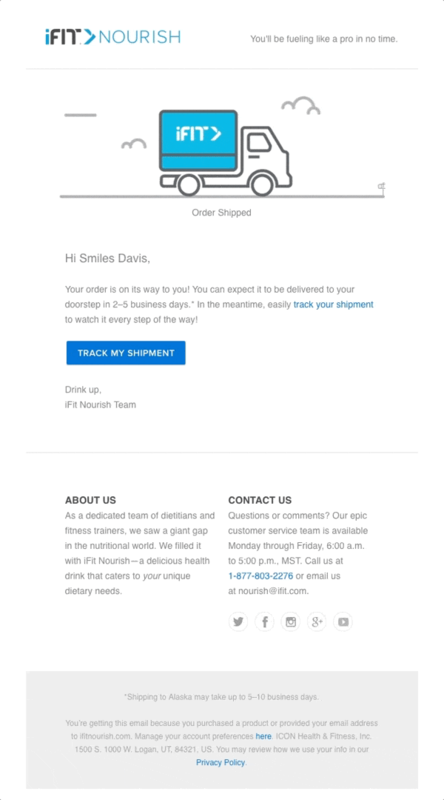 Subject: Smiles Davis, your iFit Nourish order is on its way! Clear and succinct subject line that is personalized, which can increase open rates. You can’t see it here, but the main image in this email is a GIF of the truck in motion, alluding to the fact that the product is on the way. If you think that shipping confirmation emails aren’t worth of your attention, you couldn’t be more wrong. Like other types of transactional emails, shipping notifications are opened and clicked far more than promotional emails. This means you have a big opportunity to use them to deliver more value to your customer, build loyalty, and even drive more sales. Follow these tips to improve your shipping confirmation emails and create more value for your business.